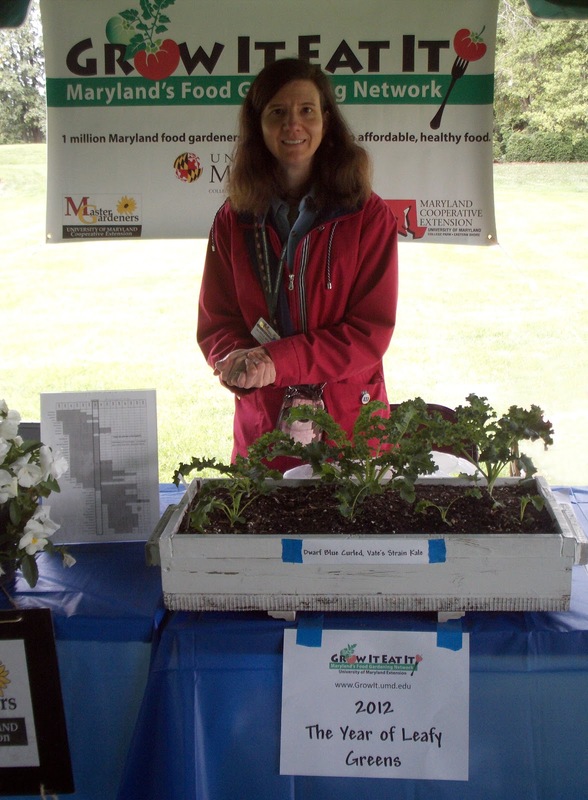 Why would a person grow kale in a salad box to show to people during Grow It Eat It spring classes, a Master Gardener vegetable class and, as pictured above with my lovely wife, for the Montpelier Herb and Tea Festival in Laurel, MD? This is what happens when you take the words spoken by Maryland State Master Gardener coordinator and the Grow It Eat It Action Team Leader John Traunfeld during the 2009 Kick-off: “go out and reach people” and combine it with “2012, year of the leafy greens” on the Grow It Eat It Blog. The kale in my salad box is dwarf heirloom and the two biggest plants in the back are fully mature. I have already started to harvest some leaves. A mature leaf is about 6 to 8 inches long and is more tender and with less bitterness than a standard kale leaf. To reach the maturity in late April, we planted the seeds in mid-February during the “Home Vegetable Gardening 101” class my wife and I taught at the Prince George’s Community College. I kept the salad box on my patio in direct southern sun and used 2 wire hoops and a clear plastic tarp as a greenhouse to keep the salad box warm when the temperature was in the 30’s*F. I used a loose row cover when the temperature was too warm. The seeds spouted in the first week of March and it takes normally 60 days to harvest, according to the instructions on the seed packet. Some early warm weather sped the maturity by one week this year. In late March I removed some of the early plants, put them in our garden and reseeded the box with more kale. That’s why you see kale plants at different stage of life. Now, if you would excuse me, I have some kale, arugula, and spinach leaves to harvest for dinner tonight. When I visited the GIEI blog this morning, I wasn't expecting to see me looking back at myself!